Hacienda at the River started operations! Green Card Fund and Watermark Retirement Communities are delighted to announce the opening of Hacienda at the River in Tucson , Arizona. 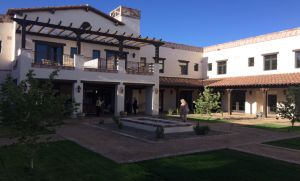 The 7.5 acre residential campus on Tucson’s Rilito River, became a unique community for individuals seeking exceptional Assisted Living, Memory Care, Rehabilitation and Skilled Nursing. In close partnership with the University of Arizona, an unprecedented access to cutting edge university-based clinical care, programming and research has been developed. Over the last 18 month investors from all over the world watched via a live web camera to observe the progress of construction. Starting operations opens the next stage of the project and will continue the successful job creation efforts by Watermark. More information about this project as well as future EB-5 projects by Green card Fund are available are available by visiting Green Card Fund’s website, sending an e-mail to info@greencardfund.com or calling Green Card Fund at +1 602.648.2714.